Written on November 30, 2007 by Rylan & Kaitlyn. Well how am I supposed to make a news cast without a reporter? Kaitlyn fell asleep with my mom last night so we couldn't get a video up. Sorry about that. It has been a pretty fun week and I was really hoping to show you some great footage of it. First, what does a baby need when they are crying? They may need a diaper change or to be fed. When we got home the other night from some Christmas shopping, Kaitlyn was crying up a storm so I offered to feed her. Yes, I sat down and lifted up my shirt. My dad had to explain to me that I couldn't do what my mom does. I was a bit bummed out but happy to see my mom come around to corner to help with Kaitlyn. Kaitlyn is a chatter bug now. New sounds are coming out of her mouth everyday now. I guess that goes for me too. I have learned so many words lately that it blows even me away. My favorite saying right now is "butter cheese chair" which of course means I want a peanut butter and jelly sandwich with cheese and for me to sit at the table in the chair. It makes perfect sense to me. My grandma moved into her new home which is pretty exciting. They have a big house now where I can run around and chase her cats and dog. Speaking of houses, I think my mom and dad have decided to take our house off the market. After 10 months, it just isn't selling. I think that they are talking about doing some upgrades on our current place though which could be exciting. Oh, I also heard them talking about getting a new car. Did the word minivan come out of my dad's mouth? Amazing. It is definitely Christmas'y in our house. My mom spent the week decorating our house. Her decorations even include a Mickey Mouse head shaped wreath. It is the neatest thing. I really like the Christmas tree that we have up as well. We already have under it filled with gifts! Yes, my mom and dad have already finished our shopping. It isn't even December yet! Oh, they have Shrek and Mickey Mouse wrapping paper. I really like that too. I think that might be it for now. I promise next week not to let Kaitlyn fall asleep early so we can get a video up. Have a good weekend. Written on November 29, 2007 by Kevin. 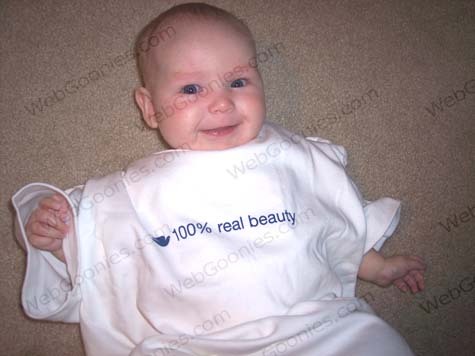 We support the Dove campaign for Real Beauty. Do you? Rylan running the golf course as Peter Pan. Written on November 27, 2007 by Kevin. Written on November 26, 2007 by Kevin. This year we made a trip up to Flagstaff, AZ to celebrate the holiday. In past years, we headed east to the kid's great aunt's house for a parade and lunch. This year though we headed up north to enjoy the cold weather and more of a winter feeling than down in Phoenix where it is still hot during the day. This was a new house for Rylan and luckily we were forewarned about all of the stairs. Rylan enjoyed free reign of the house with a watchful eye. His great aunt surprised us by having a kids table with all of the necessities including crayons and a coloring book. We packed him plenty of toys as well to help him stay occupied. We started Thursday with a breakfast which included homemade sticky buns. 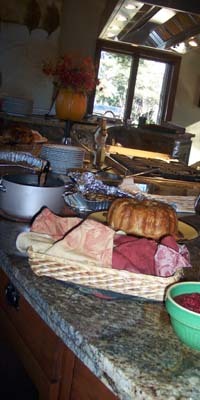 A prelunch was served which included split pea soup and butter nut squash soup. Rylan ate these up. He also enjoyed the pizza that had goat and gorgonzola cheese, walnuts and honey on it. It was certainly a pizza that Rylan had never had before but he loved it. He has exquisite taste buds it seems. We broke up the day by heading out for a walk with Grandma and Grandpa. Rylan liked picking out pine cones for us to take home. He really liked running around on a nearby golf course. The main turkey meal was amazing. The aunts and the kid's grandmother worked hard making a meal fit for a king. Everyone gobbled it up except for Rylan who wasn't too interested in it. He wasn't even interested in the desserts which included our contribution of an army of chocolate turkeys. They were a hit however with everyone else. Written on November 21, 2007 by Kevin. Written on November 19, 2007 by Kevin. Rylan had a few special visitors this weekend when he showed up for his Saturday soccer practice. His grandparents showed up all the way from the other side of town to be there early in the morning. He was pretty excited. Soccer practice went about as normal as before. 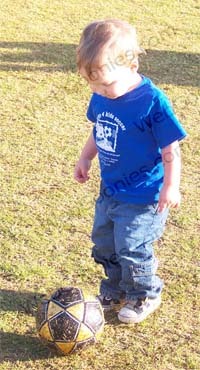 Rylan basically tried to do his own thing and did his best to get to the park right next to the field. He did participate in a few things though with the rest of the kids. When the coach told the kids to hop he was trying his hardest but he just can't get it just yet. He did quite well though when we put the soccer ball in front of the goal and he kicked it in. He got pretty excited when everyone clapped for him. As before, he loved playing with the kids parachute. He really seems to get into it. Last Saturday was the first day that there was actual dew on the ground which of course collected on the soccer ball. Dew and grass are certainly not Rylan's best friend and he hated picking up the ball or getting his pants dirty. As for improvements, I think he had actually done better last week but with his grandparents there, I can see that being a big factor. We have an off weekend and then he will return to practice after the Thanksgiving holiday. Written on November 16, 2007 by Rylan & Kaitlyn. Well, I am a bit sad to say that today will be the last Week in Review. I am however very happy to report that it will be receiving a new format. I think all of you will find it thoroughly entertaining and certainly a great way to wrap up the week. Look for that, starting next week. For this week though, we didn't do to much. We did however celebrate a birthday. Unfortunately it wasn't my birthday so that was a bit of a bummer but we did have some ice cream. Last night we picked up the new Shrek 3 movie. I am pretty excited about that because we saw it in the theater and it was hard to sit still for that long. We also went Christmas shopping last night. I got a couple peeks at some of my gifts but I didn't let anyone know. Kaitlyn is definitely going to get some good ones this year. Speaking of gifts, well not really. I am getting my last few teeth coming in now. They don't seem to be hurting like my others did so that is really good. A bunch of random stuff happened this week that I can't even remember. I'll wrap it up there. Have a good weekend and look forward to something new at the end of the next week. It's exciting for both Kaitlyn and I. Another go at potty training.. Written on November 15, 2007 by Kevin. Rylan continues to show more and more signs that he is ready to be potty trained so starting yesterday we gave it a try again. We placed his potty in a spot where he seems to head when he needs to poop. We removed his diaper for the day and let him decide when he wanted to go. Throughout the day, we would refresh his memory and tell him what the potty was for. Sometimes he was quite fine with it and other times he seemed to get mad that we kept talking about it. I made a fort with Rylan and in it, was his potty. He was sitting right next to it as I was talking to him about it. He kept saying "Potty" and acknowledged its purpose. As I stepped out of the fort to make it stronger, Rylan came out as well a split second later. After fixing the fort and heading back in, I found a spot on the carpet just inches from the potty. In a nice manner, I explained to Rylan that he is to use the potty and not the floor. He seemed a bit disappointed in himself. We gave him a diaper for the rest of the day and will try again today. Is it your normal technique? I don't know, probably not. Rylan seems to like to make changes on his own so we wanted to encourage that. Many people have an award system setup for when the child uses the potty. Our encouragement, at this point, is him getting the chance to wear Finding Nemo underwear. He seems pretty happy with that prize. Written on November 13, 2007 by Kevin. For those who do not know, it is common for website owners to monitor where and how people are coming to their websites. Most of our traffic is generated from Google Searches, some of which are funny or even disturbing. Here are a few of my favorites lately and my responses to them. my children are ugly - It's OK, they will eventually grow out of it. has anyone seen doodlebops live - Yes, I think someone in the world has. i took his diaper off stuck my finger up is bum - Please don't. poop back and fourth - Huh? dish soap in a dishwasher - Welcome to the club! my wife makes me wear diapers - No comment. how many diapers per day - Way too many! Written on November 12, 2007 by Kevin. Kaitlyn seemed to always have cradle cap from the time she was born. I can't tell you how many times we talked to the doctor about it, including urgent care when we went for other reasons. They all gave us the same answer. Cover her head in oil and then brush it out. Well this would work for the day but by morning it would return. This had gone on for months until her scalp finally began an infection and then the doctors rushed in with some real help. Now that her head is 99% cleared up she is finally starting to really begin to grow hair. In fact, it looks like her hair is trying to make up for lost time and is sprouting rather quickly. She still has splotches of no hair but the hair that she does have is now fluffy while her little mullet type hair in the back remains the same. It's amazing the changes that have taken place since we began some real treatment for her cradle cap. She is like a whole new baby girl that really loves to smile now. I only wish that the doctors would have really helped us earlier. How many times did we need to hear the same thing? Written on November 9, 2007 by Rylan & Kaitlyn. Well as my dad said, me and Kaitlyn went to the doctor for our normal checkup this week. Usually I am great but I just wasn't OK with the doctor checking my ears and mouth. Luckily though, I didn't need to get any shots. Kaitlyn did however and she cried and cried. Later when we got home I gave her a kiss on her legs where they gave her the shots. I know how hard it is to get those shots and I wanted to do what I could to soothe her. Speaking of Kaitlyn, she has been a whole new baby lately. For months, she has been battling with severe cradle cap and after many doctor visits, it finally got infected and not until then did they begin to help us treat it. Now, her head is just about completely cleared up and she has such a brighter look. I think it was itching her a lot which made her grumpy. She has really perked up lately. I love my sister a whole bunch. Well we missed soccer practice last week because I was still sick with croup. Hopefully we can make it there tomorrow. I have my new soccer shirt to wear and everything. It is getting cold outside in the morning so I don't know how that is going to work out, especially as we get into December. How do they expect little kiddos to do anything when it's so cold? I don't know if I have much else to talk about for the week. Oh ya, my dad was sneaky and on Tuesday he bought the Ratatouille movie. I think it's a pretty good movie but not as good as Shrek, Mary Poppins or Peter Pan. Those are still my favorites. Speaking of Peter Pan, my mom taught me how to fly around the room with my arms out like in the movie. The other day, something got in me, and I tried to fly off the couch. I don't know how he did it but my dad caught me from around his back. What was I thinking! Crazy kiddo. I think that's it for the week. Have a fun weekend. Written on November 8, 2007 by Kevin. We wrapped up our pediatrician visit yesterday to have both Rylan and Kaitlyn checked up (they are doing great) and off to the sticker bowl we went. Like most pediatricians offices I imagine, they have a big thing of stickers for the kids to choose from after their visit. Rylan knows exactly where to go to get this. We grab the bowl and find a seat because we know its going to take a while. Rylan loves to look at every single sticker while he says "No" in a very dissatisfied tone. We could be there all day. While I was browsing through the stickers trying to help him I spotted the following tattoos and they immediately peaked my interest both as an adult and as a parent. As an adult male, they interested me in how I may be able to freak out my wife if I all of a sudden have stitches on my arm. As a parent of two young kids though, I am wondering why these would be available to them. Why do young kids need to see a nail through the skin. Are these wierd or not? Maybe having a separate bowl for older kids would be a good idea. Written on November 7, 2007 by Rylan & Kaitlyn. I have been looking forward to this day three because now I get to show off my play areas that are in our room. A while back, my dad made me a Mickey chalkboard. I had known it was done for months but I never really got the chance to use it because we had no place for it. Now, its right next to my bed. I like drawing on it. Last night I had my dad draw Donald Duck. He told me that he didn't know how to draw him. Boy was I dissapointed. He tried anyways though and it didn't come out that bad. I atleast knew what he was going for. You can see my IKEA Tullsta chair. Most of the time it is covered in stuffed toys but occasionally I like to just hang out in it and watch what is going on. 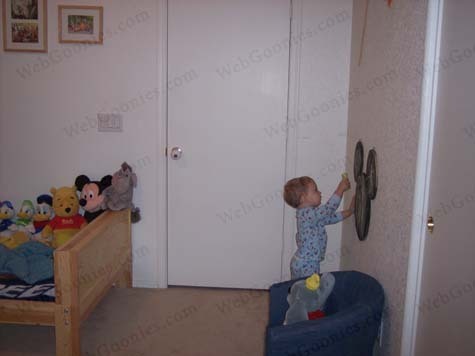 Oh, you cannot see it but above my Mickey chalkboard is a DoodleBops penant that I got when I went to the DoodleBops Live concert early this year. I wish it wasn't attached to the wall because I love just waving it around and showing my DoodleBops pride. Here is the last of my room. You can see that I have cubby boxes for all of my assorted toys. We do a fair job at keeping the room clean and these help a bit. When it's time to go to bed and my dad is brushing my teeth, I like to find a few random characters in the boxes to brush as well. My dad says that I am a good dentist. On the wall, is a special poster. That Pooh Bear drawing is from the The Worlds Biggest Playdate with Pooh event that we went too quite a while ago. They were doing a raffle and we won! There was a Disney lady there doing drawings and we just happened to have the right ticket number. It was pretty exciting. I think that about wraps up the tour. I hope you found it as fun as it is for me to live in. I really appreciate that my mom and dad did this for me. I like being able to wake up, turn on the light and play a bit. It has really opened up a whole new world for me. Thanks mom and dad! Written on November 6, 2007 by Rylan & Kaitlyn. 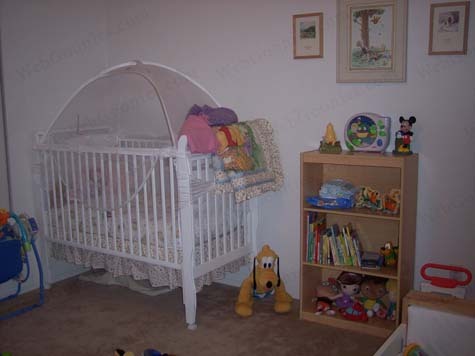 Here we are, now at Kaitlyn's side of the bedroom. She has a much smaller part of the room because she is so tiny right now. She is using a wonderful crib that I give great reviews on because I slept on it for over a year myself. My parents added the crib tent again to make sure I don't throw anything into the crib so that took a bit of the fun away. Kaitlyn's side of the room is mainly Pooh Bear related. We received a lot of pooh bear stuff when I was born and just didn't have the place to put it but she is certainly getting use for it now. She even has a Pooh Bear piggy bank. Anyone care to put in any change? Sorry for the blankets just thrown on the crib, I don't know what my mom was thinking. Kaitlyn has the bookshelf next to her but it really is for me. She isn't doing too much of reading just yet but last night I did try to show her a book. I think that might be it for her side of the room. It isn't too exciting just yet but when she gets a bit older I bet it will be a fun place. Come back tomorrow and I will tell you all about the fun parts of the room including where I keep my toys. Written on November 5, 2007 by Rylan & Kaitlyn. Welcome to the tour of my room. Over the next 3 days I will be showing off the great new room that me and Kaitlyn recently moved into. It used to be an office but now we have taken it over and it has never looked so nice. This picture is showing my side of the room. Every night, I sleep on an IKEA Vikare bed which is great. Every since that night that my dad put it together, I have loved sleeping on it. It is a perfect size for me and all of my pals. You can't see in the picture but every night, my little Shrek toy sleeps next to me. It gets cold in the house so we make sure to cover him up too. The blue blanket you see on my bed is one that my mom made. It really does a great job at keeping me warm at night. Thanks mom! Above my bed is something pretty special. Those are postcards from Disneyland. Pooh Bear, Snow White and even Jiminy Cricket watch over me while I sleep at night. They make sure that I don't have any bad dreams and they make my room look nice as well. 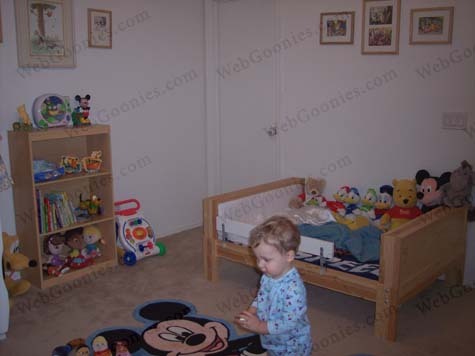 Speaking of nice, did you spot my Mickey rug? Wow is that thing awesome and big. My grandpa gave that too me when I was very very little. It has been hanging in the closet just waiting to come out. It's great. I think that is it for my side of the room. Come back tomorrow and I will tell you all about Kaitlyn's side. Written on November 2, 2007 by Rylan & Kaitlyn. Last weekend I had a fever and just felt miserable. I just didn't want to do much of anything. I had no other symptoms though so we didn't know what could be the problem. On Tuesday morning, super early, I woke up and just couldn't breathe. I was coughing and I think even had a panic attack because I was scared. Mom and dad took me to the urgent care and discovered that I have Croup. For those who do not know what Croup is.. The term croup does not refer to a single illness, but rather a group of conditions involving inflammation of the upper airway that leads to a cough that sounds like a bark, particularly when a child is crying. Most croup is caused by viruses, but similar symptoms may occasionally be caused by bacteria or an allergic reaction. The viruses most commonly involved are parainfluenza virus (accounting for most cases), adenovirus, respiratory syncytial virus, influenza, and measles. It hasn't been that fun, especially at night when it gets worse. I really do sound like a seal. I did have a bit of fun on Halloween. I got dressed up in my pirate outfit and took a trip to Ikea which I always love. The place was empty so that was nice. After that we headed over to the haunted house that my Great Uncle sets up each year. I even went through it. My dad held me while we walked through pitch black rooms and then we came to a room that had a guy with a chainsaw. That was pretty crazy. We made it out in one piece though so that was good. It wasn't that scary though. Oh my dad wanted to remind everyone that you only have one more day to sign up for the giveaway. We have had some great response to the Bob device that is now sitting next to our television. I wonder when I get to use it. Maybe I shouldn't want too. Next week is going to be pretty exciting. I will be giving everyone a tour of mine and Kaitlyn's room. I think it's a great room and I can't wait to show it off. This weekend we will be going to the local Scout-O-Rama event. My dad used to be a scout so he picked us up a ticket to check out this years event. I know that someday I may become a scout as well so we'll see how this goes. I know that my dad hasn't gone to one in like 16 years he said. I wonder what it's like. I guess that's it for now. Have a good weekend and don't eat too much candy. Written on November 1, 2007 by Kevin. The day itself started quite grouchy. Rylan has been sick and his sleep schedules have been pretty out of whack. You could just tell that he was going to have a rough night. Tie all of that into the fact that we went over to my uncles home and had to see a bunch of people he had no idea about. We made a trip to IKEA before stopping by the party so that we could pickup their freebie gift for kids dressed up. We snagged a few of their KORALL KRABBA toys. 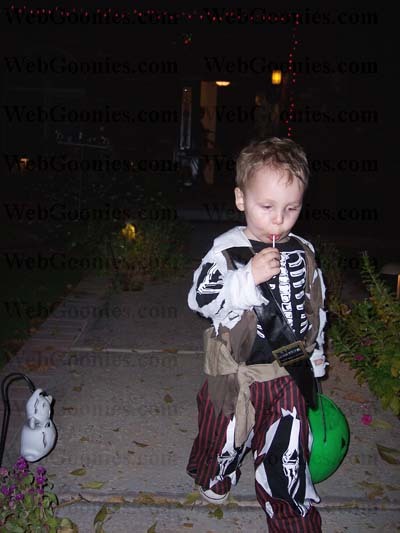 When we got to the party, Rylan was pretty worried about everyone, costume or not. We tried to get a bit of food for him but he just wasn't going for it. It took quite a bit of time to get him settled enough to even try the food. His highlight may have been when he found the mini pumpkin cakes. He snagged one and ran away happy as can be. We decided to go trick-or-treat with his grandparents and he did quite well. He was holding my hand for the majority of the time without too much of a hassle. We went house to house and everyone loved his costume. A few of the houses allowed him to pick out his candy and he took his sweet time looking at every piece. Kaitlyn did amazingly well. She let her grandma and grandpa hold her without a fuss. We walked her around in her pumpkin outfit which everyone loved. She barely made a peep the entire night which was helpful. We finished up the night and headed home. Rylan was dead asleep but of course once the house door opened he woke up. 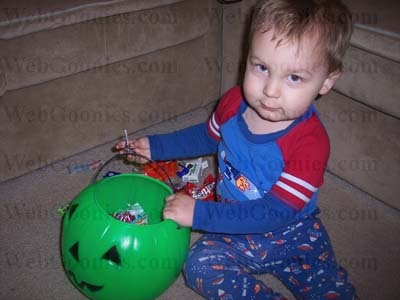 He got one last chance to examine his candy loot before heading upstairs for a teeth brushing and off to sleep. Overall it was a pretty successful night and I think Rylan did have fun. We are hoping next year he can say the old "Trick or Treat" and of course "Thank you."